We know that once you find the right family dentist, you’ll never want to go anywhere else! With Dr. Stewart and Dr. Hull, you won’t have to! We provide family dentistry services for people of all ages in the Grand Rapids area, including children as young as three or four years old. People under the age of 19 make up nearly 20% of our patient base! We enjoy seeing children, parents, and grandparents, and derive pleasure watching families grow and watching children become parents. Most major dental health problems occur in adults. It makes sense; tooth problems happen because of wear and tear, injury, aging, and neglect. These are problems that happen over time. Therefore, our primary focus is on adults. But that doesn’t mean that you can’t bring in teenagers or children! We want the family dentist to be a place you learn to love and enjoy, and want to bring the whole family. We’re confident that we’re the best family and cosmetic dental office in Grand Rapids, and would love to prove that to you. Dr. Stewart and Dr. Hull are calm and compassionate and understand the needs of adults and children – needs that are understandably different when it comes to family dentistry. If even fully-grown, well-adjusted adults feel anxiety about going to the dentist, then you can imagine how a child feels! But with our friendly staff, attention to our patients’ dental health needs, and most importantly, the care and expertise of Dr. Stewart and Dr. Hull, we can help anyone in your family feel right at home. We even offer nitrous oxide at no cost to help family members who have dental anxiety. Let us prove to you that the family dentistry office of Dr. Stewart and Dr. Hull is the right office for you and your family. 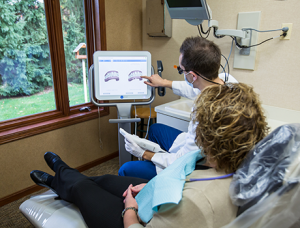 Come in and chat with us about your dental health needs. Take Care of Your Dental Health – Call Our Family Dentists in Comstock Park! Give us a call at 616-784-2377, send us a quick message through the contact form on this page, or come talk to us in the office! However you’d like to do it, we want to hear from you if you are in the Grand Rapids area, from Comstock Park to Rockford, MI. Once you come to Dr. Stewart and Dr. Hull, you’ll never go anywhere else!